This Bambino Extra Wide Gate is suitable for stairs and doorways. Four pressure points increase stability and it is easy to install with no screws or drilling required. The gate is made from powder coated steel for a durable and high quality finish. The Bambino Easy Fit Extra Wide Gate provides complete peace of mind, so that you can relax knowing that your little ones are safe. It is not always possible to keep your eyes on little crawlers as they start to explore their new found freedom. The Bambino Extra Wide Gate is perfect to keep little ones in a single room or to stop them from tumbling down the stairs. Also perfect for pets! 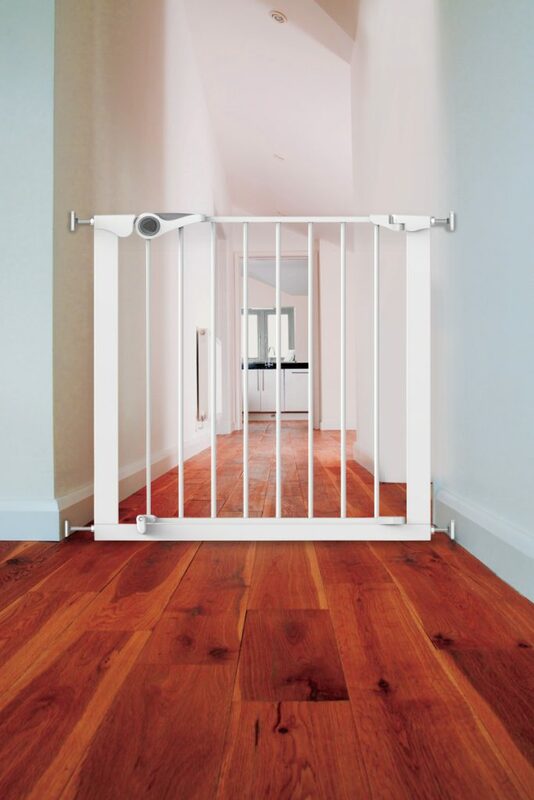 Easy to use with no drills or screws required for installation, the Bambino Extra Wide Gate can be moved around the house giving you complete flexibility. Additional extensions can be purchased to get the correct size for your doorway or opening. Please ensure that you measure your doorway correctly and measure from the narrowest point for the perfect fit! Fits most standard door widths. (75cm minimum – 82cm maximum). Mounted height 73cm. This barrier is for domestic use only. Optional one or two way opening or double lock. Flexibility to change direction of gate opening as you move around the home. Easy to install. No screws or drill required. Barrier must be installed in a strong and secure opening. 4 pressure points for stability. U-shaped steel construction for strength. Power coated steel for a durable and high quality finish. The gate is suitable for stairs and doorways. Handle lock mechanism provides security. This barrier has a manual closing system. Suitable for children aged between 0-24 months. Bambino Gate extensions are also available as an optional extra.